It's been another slow week on the reviewing front for a number of reason, so for that I apoligize. I've decided to review a controversial beer today, BrewDog's Never Mind the Anabolics. This beer splits opinions everywhere it goes just like BrewDog themselves. This beer was brewed to push people's buttons. Released to coincide with the start of the Olympics the beer is infused with creatine, an anabolic steroid. There is some conjecture in the beer world that this is a step to far from BrewDog in their quest to be notorious, personally I think it's a really clever idea. However this will count for nothing if the beer doesn't taste good, let's try it now! 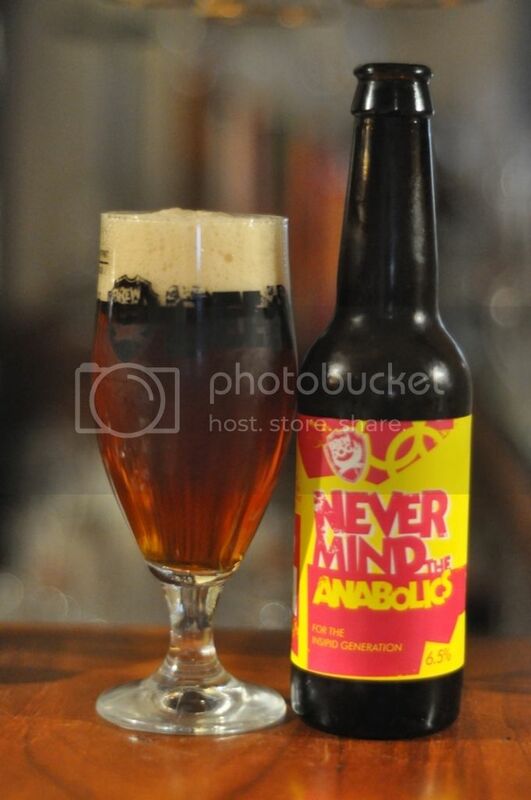 Never Mind the Anabolics is an English IPA and pours as one should. The beer is a deep amber colour with streaks of copper and orange liquid as well. The carbonation seems minimal but there is still 3 fingers of tight creamy brown head atop the beer. The retention of the head is good and the glass is noticeably laced, all-in-all it's a good looking English IPA. On the nose I get quite a classical English IPA feel. The beer has strong malt driven base with lots of berries and fruit also present. There are some hops present but they are nowhere near as prominent as they would be in the American take on the style. I don't know what creatine smells like but I'm pretty certain I can't smell any of it on the nose. One of the most unusual elements of the nose for me is the presence of a strong mango aroma, I'm really quite intrigued as to what this will taste like. So there is alot more flavour in this beer than I would normally expect from an English IPA. Every single element is pronounced and discernible to the drinker. There are flavours ranging from the standard English malts through hops, tropical fruits, some spices and even pepper. The overall taste is sweet but this is doing disservice to the hops, which are surprisingly bitter for an English IPA. Overall, this is a nice beer. Take away the fact that this beer was brewed to ruffle some people's feathers and that it has been mocked for BrewDog's insistance on putting steroids in it for a gimmick. If you can ignore this and drink it as if it's a normal English IPA, it's quite a good example of the style. Also in terms of a marketing idea or a publicity stunt, it's a pretty good one. Never Mind the Anabolics was a very limited release so if you are lucky enough to find one enjoy it!